Our priority at Romanian Ministries is to help Christians in service in Romania. This is what we believe the Lord has called us to, and what we love to get involved with. It has been very apparent during our visits, however, that cases of exceptional poverty exist within churches, and that they also require our help. These people may not have a niche ministry, but they do have an abundant need. Believing that we have a biblical responsibility not to pass such people by, we allocate approximately 20% of our funds to them. We need much godly advice from Romanian Christians and wisdom when distributing this sort of aid, with some of those we’ve helped in recent years being as follows. 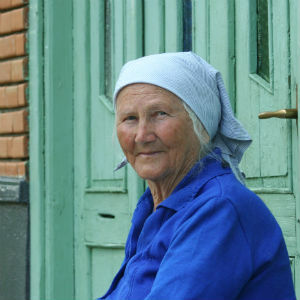 Catita is an elderly Christian in the village of Draut, western Romania. Her interesting house might indicate a comfortable lifestyle, but closer examination and sight of the very aged furniture reveals something of her plight. Her husband is dead, and her children, to put it as charitably as possible, are infrequent visitors. A friend helps with cleaning and shopping, but the small amount of payment necessary consumes most of Catita’s pension. We’re glad, therefore, to help her with a gift on each visit, which she spends on a store of firewood in the bitter Romanian winters. 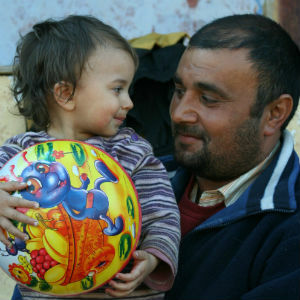 Iosif and his Roma family of a wife and nine children live in the village of Araneag. Alerted to their need by members of a local church, we visited and found ourselves in a delightful Christian home, albeit one in great poverty. Feeling led of the Lord to give Iosif £100, this brought a statement of amazement from him and thanks to the Lord for His goodness. Shortly before this, Iosif had needed to buy a new horse for his work of transporting wood from local forests. Needing to borrow money to pay the full amount, the amount borrowed exactly equalled the £100 we gave. How humbled we were, and thanked the Lord! 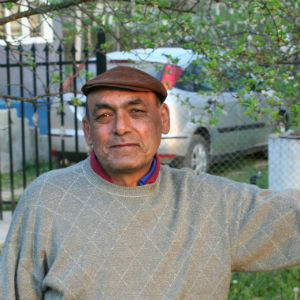 Geza is a stalwart of Cornel’s home congregation in the village of Draut. His paucity of education does not restrict his doctrinal interest, as was proved on one journey when he turned to Cornel after a short period of silence, and inquired “well, what do you think of predestination…?”. Recent years have brought him considerable financial difficulties, however, as his many years as a coal miner have taken their toll on his lungs. Battling with the Romanian Government to receive any pension at all, the church in Draut have at times given small amounts of money to assist him. We’ve been delighted to add to these, and Geza’s gratitude has been a delight to see. Danny was a very tall young convert when we first met him, the fruit of a recent evanghelisare (evangelistic week) in Cornel’s home church. Training to become a mechanic, his course’s distant location meant he sometimes needed to walk 21 km on Monday mornings, prior to the return walk home the following Friday evening. We were glad to be able to intervene and help with costs, which after two years, saw Danny pass his exams. 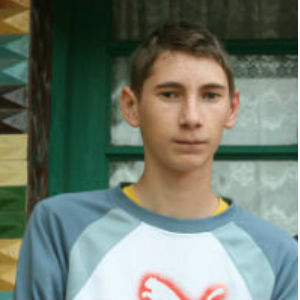 Alex is a 19 year old from the village of Araneag, and suffers from a form of cerebral palsy. Wheelchair bound and unable to communicate clearly through speech, life is for Alex is difficult. 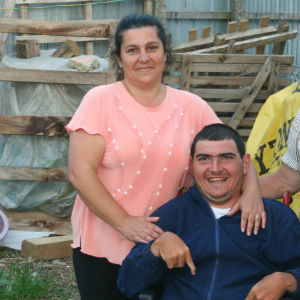 Disabled people are shown far less sympathy in Romania in general that they are in the west. Alex’s parents, Nelu and Rodica, are devoted to him, and show him huge amounts of love and care. Alex sometimes travels to special camps for the disabled, and on each visit, we give his family some money towards the costs of these as well as ongoing general expenses.